You have until Noon, GMT, Friday 5th May to enter. 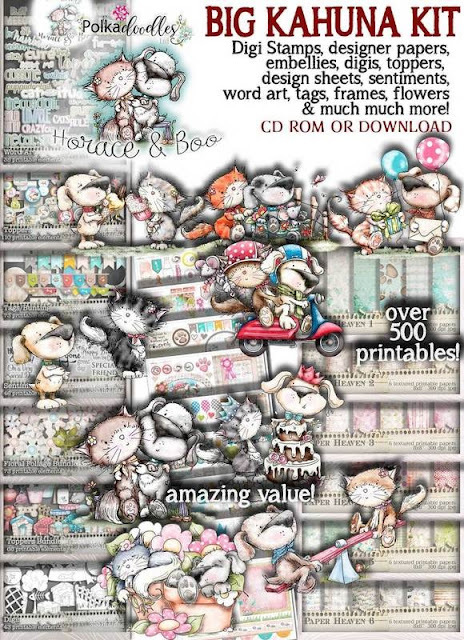 The Big Bundle Winnie Sugar Sprincle you can find here. 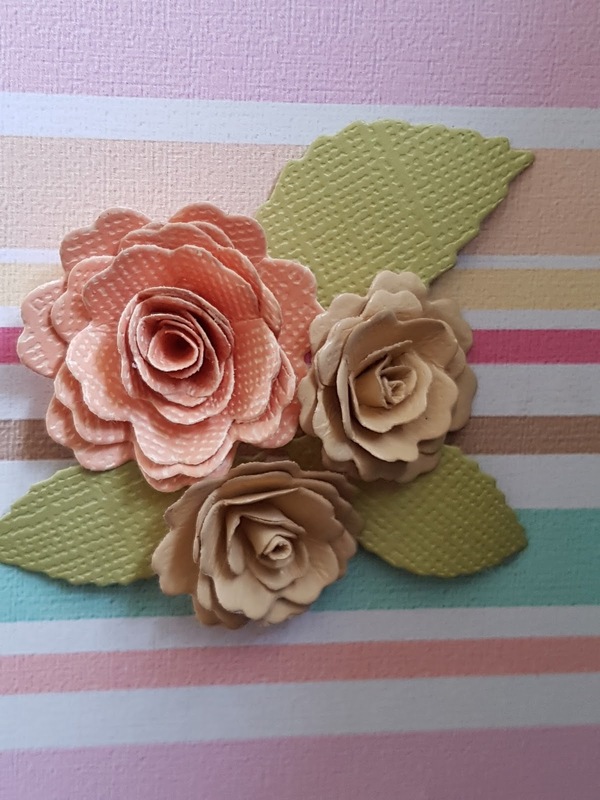 The flowers I have made from Foamiran itself. Everywhere a bit glitter glue on it, gives the whole a sweet playfulness. Anjie - I've used design sheet 1 from the ever so sweet Winnie Sugar Sprinkles collection. I started by drawing faux stitching around the edge of the card and running an ink pad around the edge of the paper. I then fussy cut and mounted all the embellies on to 3D foam before placing them on the card. 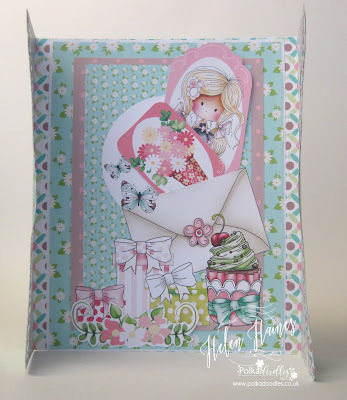 Bev here, I thought I'd use Winnie Sugar Sprinkles Springtime Design Sheet. I'm amazed at how much Nikky manages to cram onto one of these things. I left the little banner plain for now that way I can personalise it for my intended recipient. Such fabulous creations from the team, make sure you check out all those lovely Design Sheets we've been using! See you next week for a new challenge! Closes Noon, GMT, Friday 5 May. Winner will receive a $10 voucher to the Polkadoodles Digi Store. 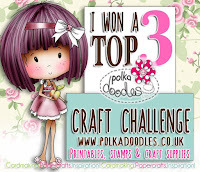 You do not need to use Polkadoodles Products to enter our challenges, but we do love seeing your fabulous creations with Polkadoodles images. Before we see what the Design Team have been up to, have you seen the latest Polkadoodles New Release? 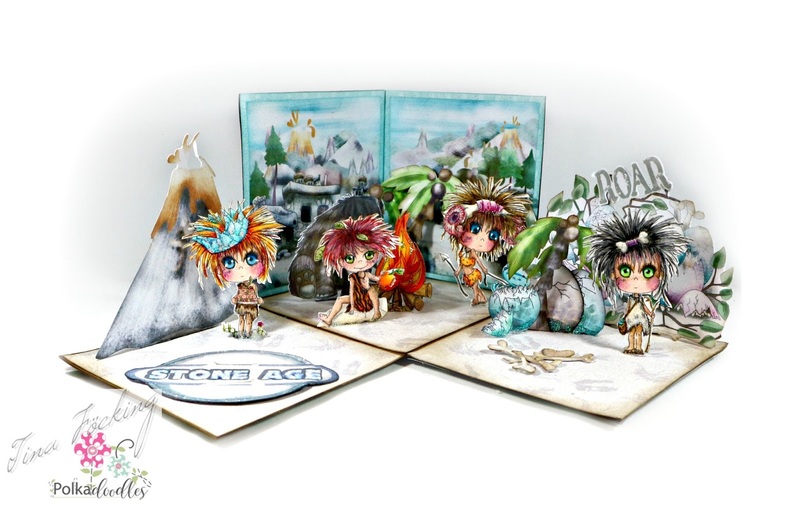 creations by the Design Team using this wonderful collection HERE! is always lots of daily inspiration to see and to get those creative juices flowing. Jacki - For my cards this week I was spoiled for choice I had already designed my first card using Sticks and Bones DS 2 Then our lovely Nikky goes and releases the ubber cute Horace and Boo so I decided to use one of these as well, well who can resist! Both cards were super easy to make For the sticks and Bones I used a paper and image with greeting and attached them to my card blank using some bones as embellies. For my other this was just using just a topper from DS 2 and then using an embellishment (fishbowl) to finish. 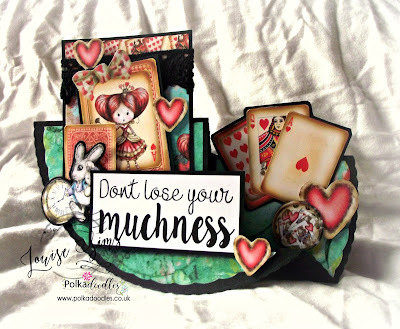 Ruth: I've used one of the design sheets from Work and Play Vol 12 plus added some buttons and black card from my stash. Really nice and easy to use plus I can get two cards plus lots of extra elements from one sheet! Karon - I have used the delightful Helga Hippo Collection and one of the wonderful Design sheets from the collection (Design sheet 2-06 in the collection). 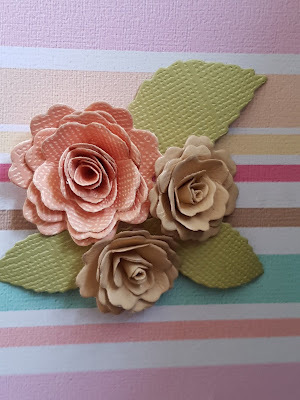 This design sheet is also part of a Duo Design sheet download #9 if you only want to buy just a couple to make a card :-) I have also used the Flower Flourish Die. This card is just 4" by 4" and is to be part of a gift set. 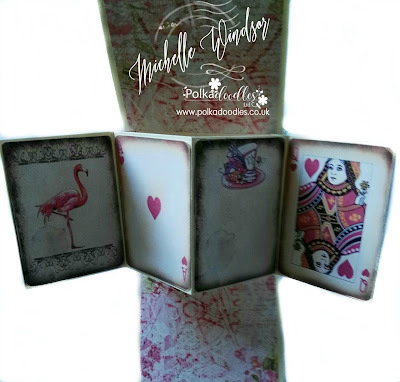 Pauline - I decided to use a fun design sheet from the Work & Play 11 Collection to create my card, I printed the sheet twice so that I could add a decoupage layer and added some of the super papers and a sentiment from the collection. 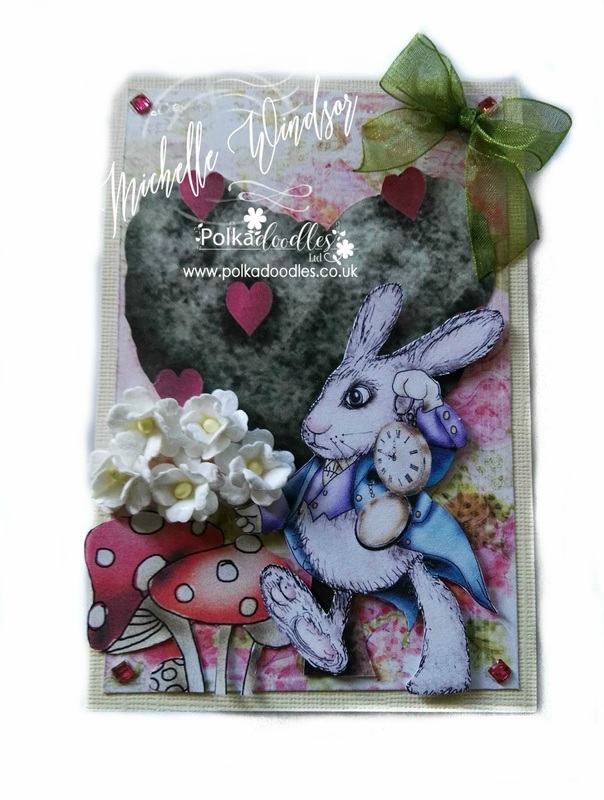 There are two images, two sentiments and embellishments on each design sheet so I have enough left over to create another card. 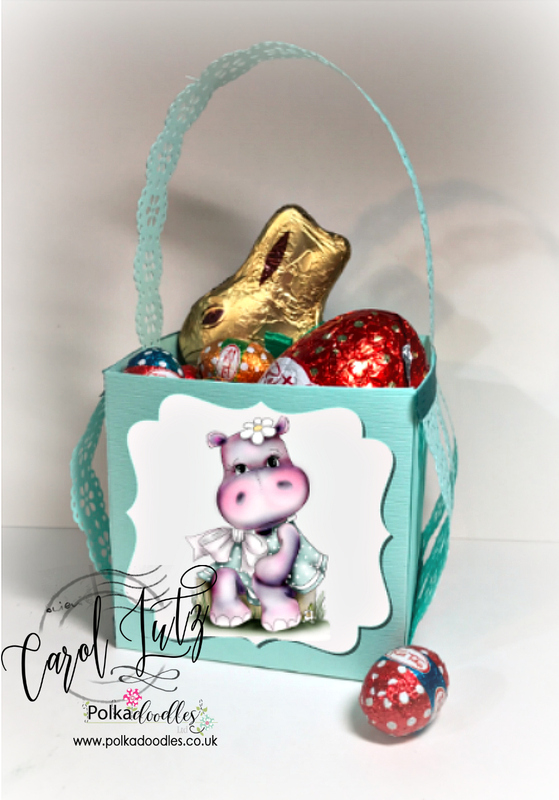 Carol - so today I have made a super sweet card featuring Design Sheet 10 from the fabulous Horace and Boo collection. 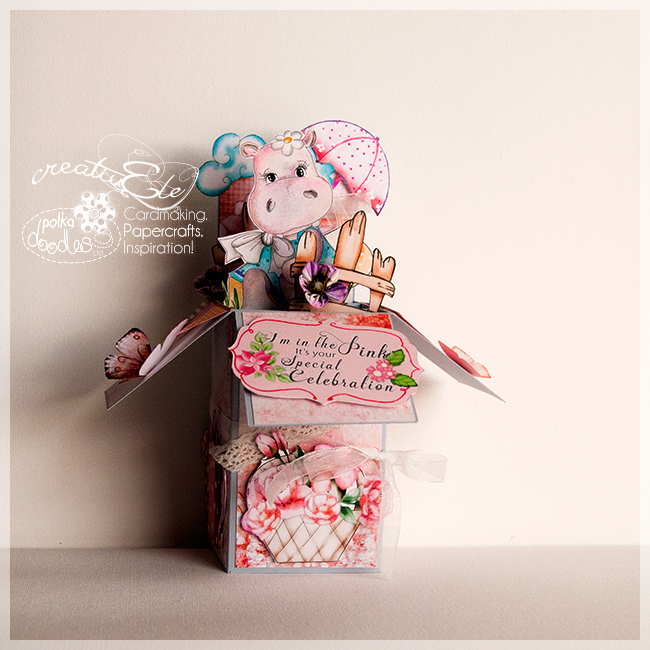 Lisa - For my make I have used a design sheet from Work & Play 5 Festive Hollybobs Collection. I've teamed the elements with some patterned papers from the same collection and made a clean & simple Z fold Christmas card. You have until Noon, GMT, Friday 21st April to enter. 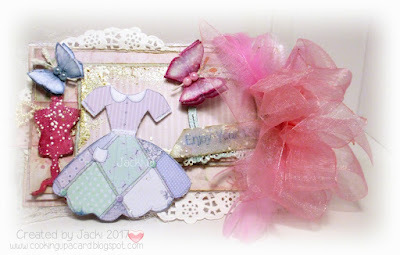 Jacki - For my card I have gone completely out of my comfort zone and gone in another direction totally to my usual cards (but boy did I have fun) I hae made a dainty 4½ x 6½" card using papers from the Beau paperie collection I then used embellishments (dress and butterflies) from the Summertie collection and the Winston collection. The chipboard frame and dressmaker dummy are from my stash. Ruth - I've gone big and bold this week - I've made a shaped number card using my own templates and a paper from the Frederika Mini CD Collection plus two wooden skewers and I've made the bunting myself plus added some star die cuts. Pauline - I decided to create a Side Step Card for this weeks challenge. 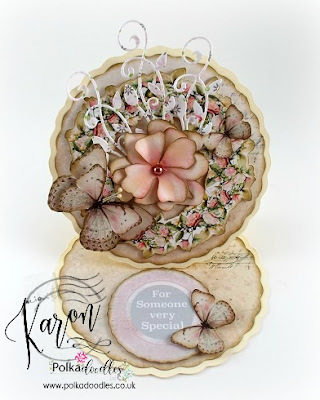 I used the gorgeous Just For You Winnie stamp from the Winnie Sugar Blossom Stamp & Paper Pad Boxed Gift Set. 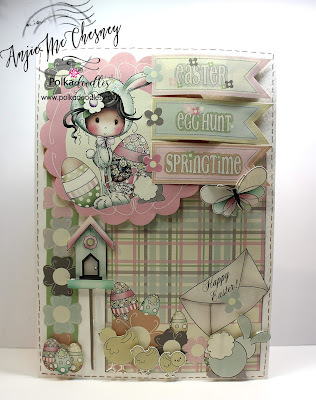 I teamed her up with papers from the Winnie Sugar Sprinkles Springtime Download Bundle. The sentiment and flowers are also from the Winnie Sugar Sprinkles Springtime Download Bundle. Carol - For my DT inspiration this week, I have made a cute Easter basket featuring Helga and filled it with delicious goodies. CreativEle - My love for Helga Collection brings me for this new project to create a card box. I have used one of the 28 printable sheets and digi HELGA is colored with my worn out pencils. 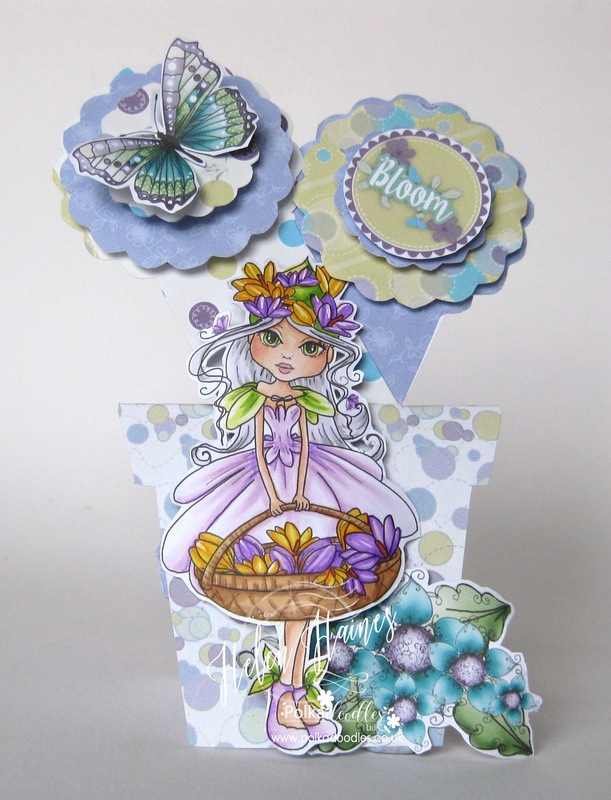 Karon - I have used the wonderful Belle Papillon Collection for my shaped easel card. 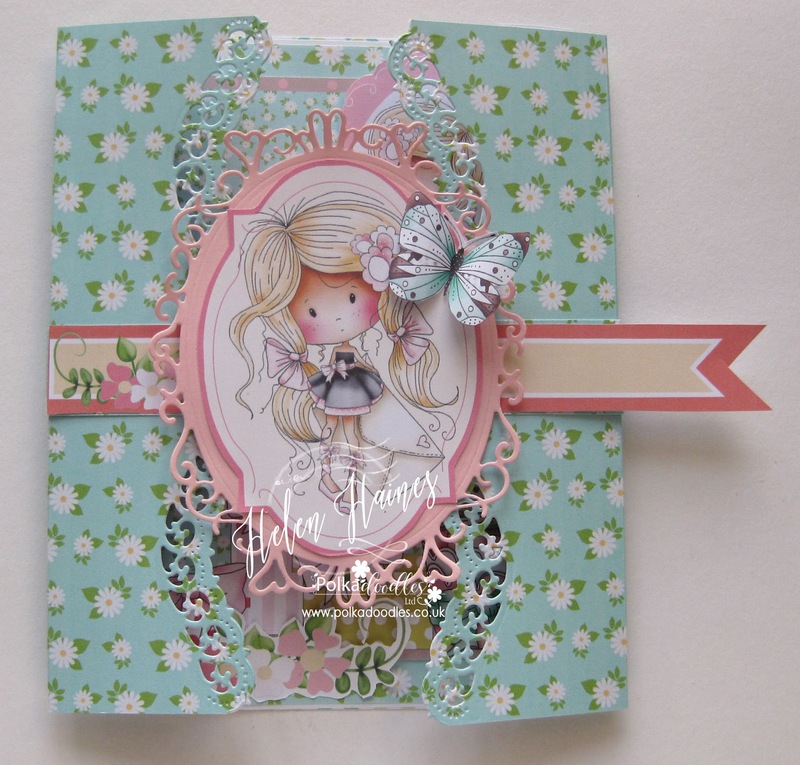 I love all the papers, floral elements and beautiful butterflies in this wonderful set. I also used the versatile Flower Flourish Die. 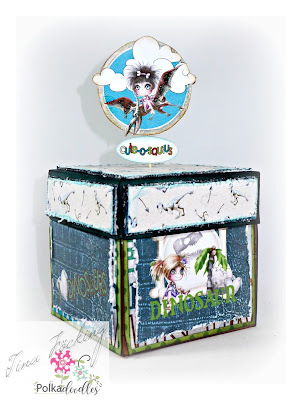 Lisa - For my 'Anything but Square' make I have made a shaped card and decorated it with stamping, papers and dies from the Belle Papillon Paper Craft Kit and an oval from the Bubbleicious Frames die set. to claim your prize of $10 worth of downloads from the digi store. Closes Noon, GMT, Friday 21st April. Tina - This time I made an Explosion Box and used the "Stick & Bones - Big Bundle". Each area is 4 x 4 inch and the inhabitants I have colored with Polychromos. Much more photos and details you find on my Blog. Scatty Jan - For my project this week I have made a saloon milk carton - I cut this on my portrait and was a lot of fun decorating up - I used the lovely images from Work & Play 3, that I coloured up using Graph'It Markers, You can also purchase the images seperately Cowboy as a digi image, also as a clear stamp, and Cowgirl as a digi stamp - Lots more photo's on my blog. 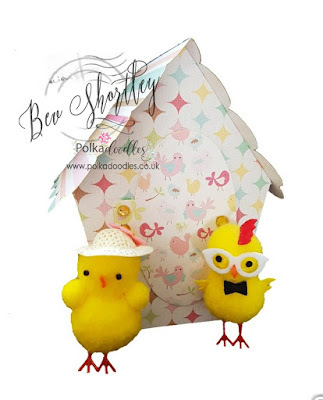 Bev here with a cute 3D Birdhouse using Twiggy & Toots. I initially chose 7 printed 3 separate backing papers onto 300gsm card then turned them over and printed the templates onto the rear then simply cut them out and constructed the project and just for a little decoration I made some roses using the Flowers 1 Die set and added them to the roof. Michelle - I have made a Twist and Pop Card and I have used Winnie In Wonderland Big Kahuna Bundle to make it. This was a lot of fun to make you can find the Video I used to make it on my blog. 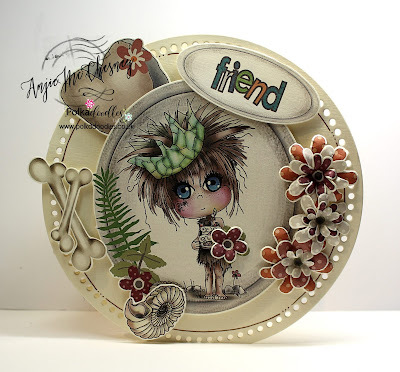 Anjie - I have used left over bits of design sheet 1 from the ever so cute Sticks and Bone collection. I used the other bits for a make a few weeks ago. This is why it's always worth while saving the bits that are left over. I've placed the image and all the embellies on to 3D foam to make them pop. I've shaped and layered the flowers and added to the edge of the card.